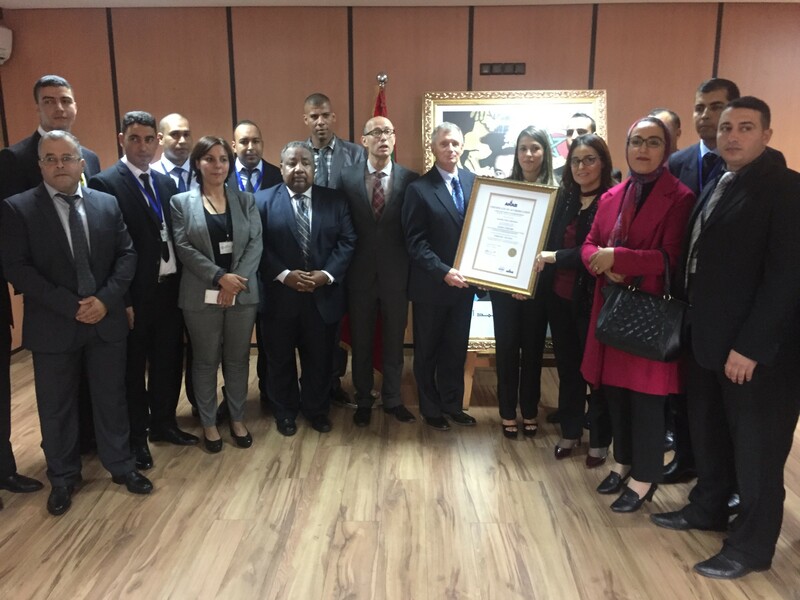 David Sylvester, the deputy executive director of the National Forensic Science Technology Center at FIU, presents the American National Standards Institute-American Society for Quality National Accreditation Board accreditation to officials from the Management and High Throughput Genotyping Unit of the Directorate General for National Security Police Scientific Laboratory and other laboratory officials in Casablanca, Morocco. NFSTC trained personnel from the laboratory that is home to the only DNA databasing unit in Morocco. That lab controls the uploading of genetic profiles that could lead to the identification of suspects in criminal investigations. Forensic scientists from the Management and High Throughput Genotyping Unit of the Directorate General for National Security Police Scientific Laboratory in Casablanca trained with the center through a 12-month grant from the U.S. Department of State Bureau of International Narcotics and Law Enforcement Affairs. In eight months, the team at NFSTC translated and reviewed material from French to English, coordinated training with personnel, reviewed quality assurance documents, and addressed issues that could affect accreditation. NFSTC has conducted assessments, consulted on forensic science and crime scene training in Canada, Costa Rica, El Salvador, Guatemala, Honduras, Panama and Thailand. Quality forensic science is becoming increasingly important as more countries develop their laws and adversarial systems of justice.